^ Norris, Frederick (1997). 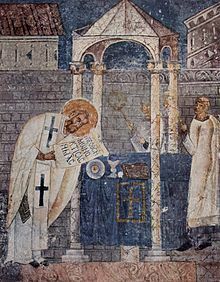 "Basil of Caesarea". In Ferguson, Everett (ed.). The Encyclopedia of Early Christianity (second edition). New York: Garland Press. ^ Foley, O.F.M., Leonard (2003). "St. 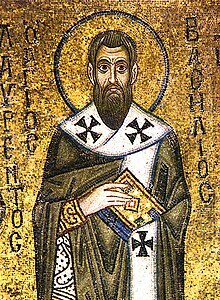 Basil the Great (329–379)". In McCloskey, O.F.M., Pat (rev.) (ed.). Saint of the Day: Lives, Lessons and Feasts (5th Revised Edition). Cincinnati, Ohio: St. Anthony Messenger Press. ISBN 978-0-86716-535-7. Archived from the original on 23 December 2007. Retrieved 2007-12-15. ^ Basil. "Hexameron, 9.1". In Schaff, Philip (ed.). Nicene and Post-Nicene Fathers (2nd Series). 8 Basil: Letters and Select Works. Edinburgh: T&T Clark (1895). p. 102. Retrieved 2007-12-15. . Cf. Hexameron, 3.9 (Ibid., pp. 70–71).